General Electric Co. slashed its quarterly dividend to a penny a share, promised to restructure its power unit and said it faced a deeper accounting probe as new Chief Executive Larry Culp took his first steps to revive the struggling conglomerate. GE said the U.S. Securities and Exchange Commission and Department of Justice had expanded ongoing investigations to include a $22-billion writedown of goodwill from GE’s power division, which GE reported on Tuesday. The United Nations International Maritime Organisation is in the process of introducing new marine diesel standards which economists worry will have a serious negative impact on Climate Change and the US economy. It would all be so simple if engineers just got on with it and solved the problems. And if someone makes money from finding a solution, who cares? U.S. wages and salaries rose by the most in a decade while private sector payrolls increased by the most in eight months in October, suggesting overall job growth accelerated this month after Hurricane Florence weighed on restaurant and retail employment in September. The Labor Department’s Employment Cost Index showed wages and salaries, which account for 70 percent of employment costs, jumped 0.9 percent in the third quarter after climbing 0.5 percent in the prior period. While claims of increased severe weather due to “climate change” aka “global warming” are thrown about by the media, with recent claims that more and more tornadoes are shifting east in the U.S., the fact of the matter is that the trend for strong tornadoes is decidedly down, according to data from NOAA. The US is on track to have the lowest annual tornado count in 65 years. h/t to Mark J. Perry, AEI for the graph. TCI was invented by Martin Mlynczak of the Langley Research Center along with other NASA and university colleagues. For the past 17 years they have been using the SABER instrument onboard NASA’s TIMED satellite to monitor the wattage of infrared emissions from the top of the atmosphere. 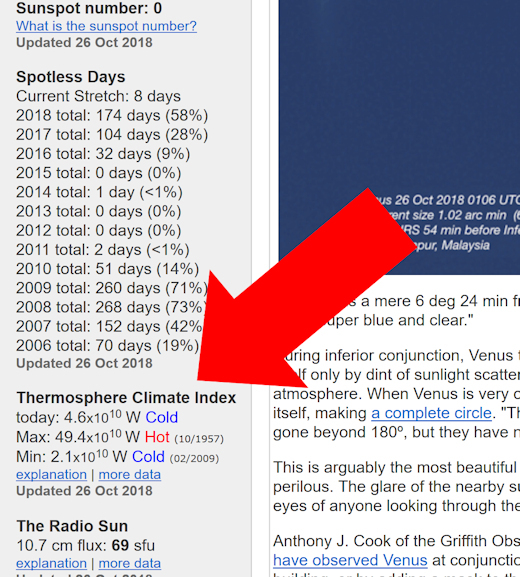 Recently, they realized that those measurements could be used to summarize the state of the thermosphere in a single daily index, the TCI, expressed in watts (W). Moreover, they learned to calculate TCI going back in time all the way to the 1940s, thus placing current conditions in a historical context. So where do we stand? Right now TCI=4.3×1010 W. That means the top of Earth’s atmosphere is approximately 10 times cooler than it was during the record-setting Solar Max of 1957-58 (TCI=49.4×1010 W). 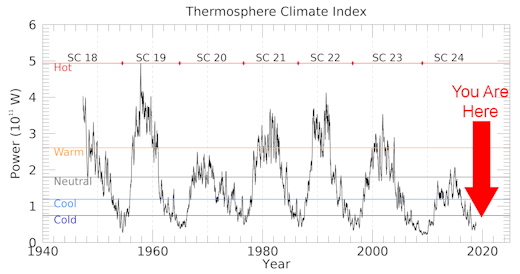 The record low value for TCI, 2.1×1010 W, was set during the Solar Minimum of 2009. It’s still not that cold in the thermosphere, although we’re getting close. You can monitor daily values of TCI right here on SpaceWeather.com. TCI not only tracks the slow progression of the 11-year solar cycle, but also it can change suddenly in response to solar flares and geomagnetic storms. As these events occur, we’ll be writing about them to raise awareness of the many ways the sun can dump energy into Earth’s atmosphere. Stay tuned!